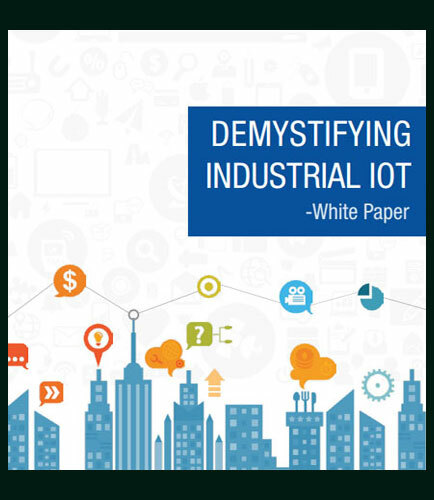 "White Paper on Industrial IoT"
The true potential of IoT is unveiled when it is used in the manufacturing and industrial section. Industrial Internet of Things (IIoT) combines the most powerful technologies that have been used in the industrial sector for ages. The collaboration of Machine Learning, Big Data, Sensors, Machine to Machine (M2M) communication, automation, Artificial Intelligence and IoT gives us a promising Formula for near perfect Industrial Operations. The Gigantic Industrial Machines will not just be powerful but also be smart. Industries are pushing to modernize systems and equipment to meet new regulations, to keep up with increasing market speed and volatility, and to deal with disruptive technologies. The Ignition IIoT solution greatly improves connectivity, efficiency, scalability, time savings, and cost savings for industrial organizations. In today’s recovering global economy, identifying and positively influencing these loyalty moments of truth- the inflection points, has become our singular challenge. Every customer interaction can make or break the relationship with your brand - from the first encounter with your brand, through the first purchase, at each touch point one encounters in your loyalty program, and into each post-purchase service encounter. In this whitepaper, recognize the most important inflection points along your customer journey from curious newcomers to brand loyalists. It addresses key questions like: What are the 10 most important loyalty moments of truth? How to identify and act on these inflection points with relationship-saving tactics? What are the guidelines for getting them right? What are the ways with which you can help foster customer advocacy? How to avoid dropping the ball with inflection points? What are the best practices to receive the full benefit of increased loyalty through the redemption experience? What is IoT Cloud Server ? When developing IoT hardware and software, one does not need to worry about setting up any servers or configuring networks or deploying databases as it is possible to use standard Virtual Private Servers (VPS). A VPS runs with its own operating system; it allows its customers to have superuser-level access so that they can install software that runs on the OS.